Dr. Gary Small's Mind Health Report is just like having renowned doctors and scientists briefing you personally (and in plain English) about what's happening in brain science today. And most importantly, what this means — in practical terms — to you and your health. Each and every issue brims over with the latest advancements in mind and brain research from the far-reaching frontiers of science and medicine. You'll find all this, and more than I can ever include here, delivered monthly right to your email — or to your mailbox, if you prefer that option. Let's face it . . . Without a decent mind, you have no quality of life. But with critical information regarding every aspect of brain health right at your fingertips — well, just imagine the life you can create for the rest of your days. And as a subscriber to Dr. Gary Small's Mind Health Report, you'll have access to the most up-to-date and crucial health information — 100% focused on keeping your mind healthy and functioning at its greatest capacity. Feature Articles. This is where top experts will take you by the hand — and give you practical techniques to help you improve and expand your brain function. Questions and Answers. 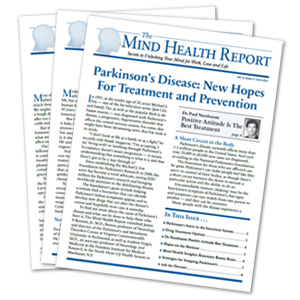 Because this newsletter is for you, leading physicians will answer questions you have about your own brain health, what you've read about in the news relating to current mind health topics, or other medical issues you find helpful. Insights. Here, new findings in research give you plenty to think about in terms of what you can do to boost your own brainpower, and ultimately your overall health. You'll find tips, tricks, and techniques to improve your brain capabilities simply and easily.